There’s been a lot of talk about the idea of male genius of late and the way it has historically been used to excuse all manner of bad behaviour: arrogance, violence and worse. 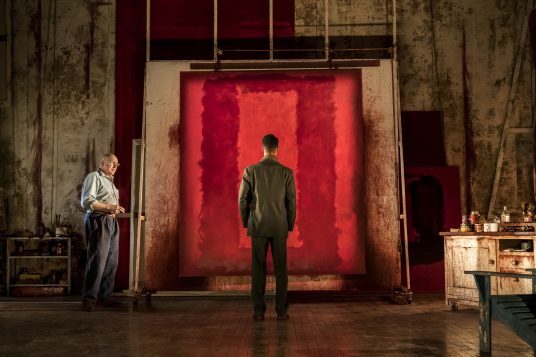 John Logan’s 2009 two-hander about Mark Rothko explores this and more. 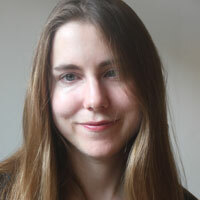 Is a capacity for “titanic self-absorption” part of what makes a great artist? Must one generation of artists always crush what came before them, or are these just the narratives we have come to accept? 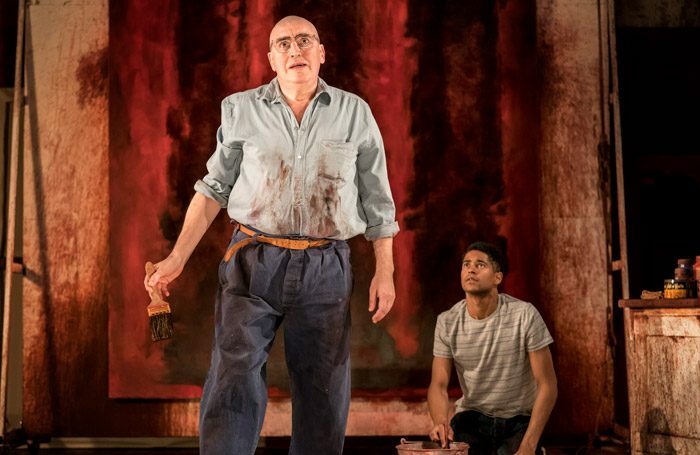 Originally seen at the Donmar Warehouse, Michael Grandage’s production went on to win six Tony awards when it opened on Broadway. 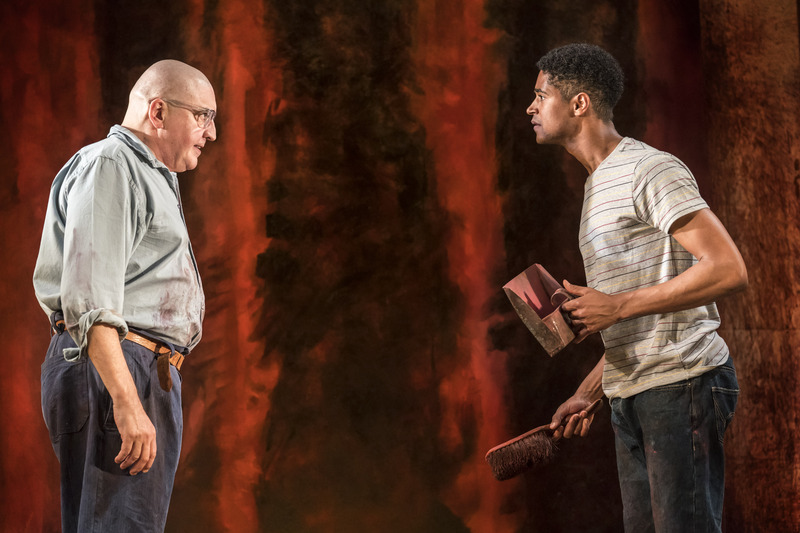 Now, for its West End revival, Alfred Molina reprises the role of Rothko with Alfred Enoch taking on the part of his assistant, originally played by Eddie Redmayne. 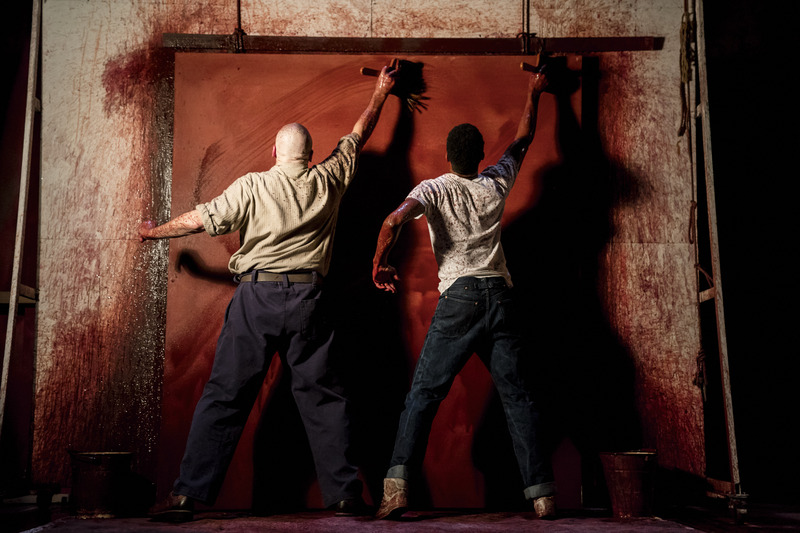 The play is set in 1958 in Rothko’s Bowery studio. The artist is at work on the series of paintings that he has been commissioned to produce for the Four Seasons Restaurant in New York’s Seagram Building – those great, throbbing canvases that now hang in Tate Modern. 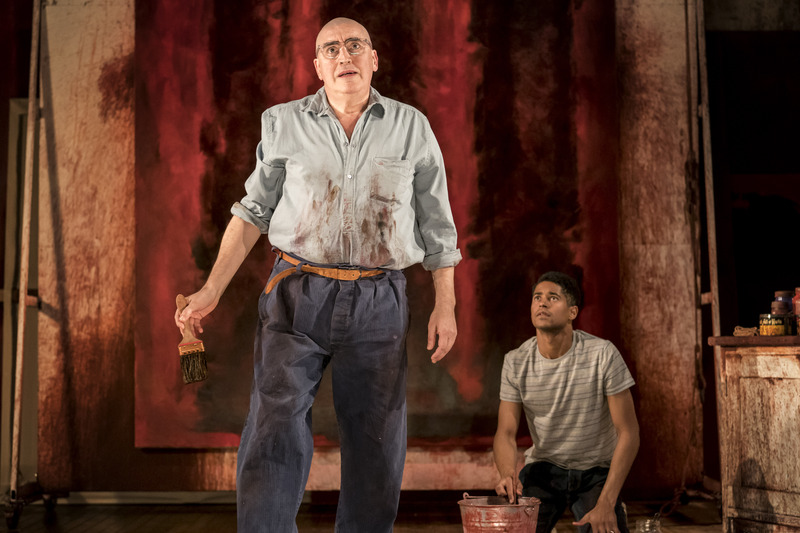 Enoch plays Ken, Rothko’s keen, green helpmate, canvas-stretcher and paint-mixer, a would-be artist himself. At first, he’s just someone at whom Rothko can hurl his theories on art, along with his disgust at the majority of people who own his works, his contempt for everything Picasso became, and his near-pride at the fact he and his contemporaries trampled cubism. 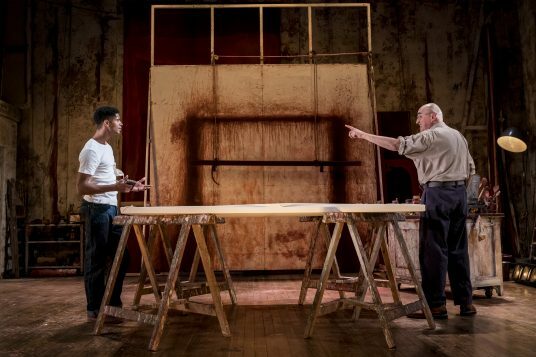 At the same time, Rothko’s anxiety at the idea of becoming obsolete, of being swept aside by the pop artists, Warhol among them, with their lack of seriousness, their fixation on the ephemeral, on comic books and cans of soup, is palpable. Molina inhabits the artist’s contradictions with the completeness one expects given his history with the role. His Rothko is a creature of ego and conviction, but also self-doubt; he’s aggressive, charismatic and vulnerable all at the same time. It’s a superb performance, one of real nuance and immense skill. Enoch brings a completely different energy to the production. He’s a warmer presence than Redmayne was and he reframes some of the play’s discussion about, say, the symbolism of blackness in art. 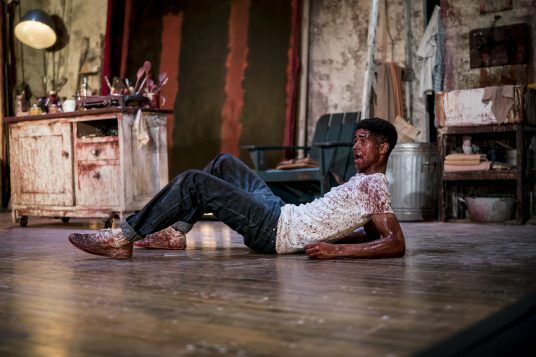 He invigorates the play, while also making its limitations apparent. The immense convenience of Ken’s murdered parents as a plot point, the red of their blood staining his memory, feels even more contrived on second viewing. There are also moments when the play feels like an essay. Grandage’s polished production, however, goes some way to countering this. 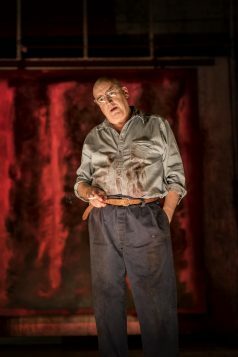 Christopher Oram’s set is a kind of glorious abattoir-temple, ravishingly lit by Neil Austin. Meanwhile, Grandage’s direction provides a reminder that painting of this scale is a physical activity as well as an intellectual and aesthetic one. In a wonderfully choreographed sequence, the two men prep a canvas, their clothes and skin splattered by paint by the end.